Sockeye salmon look through the viewing windows on the 18th weir of the Ballard Locks fish ladder in Seattle. Photo by Ingrid Taylar. CC BY-NC-ND 2.0. In early autumn, just as the temperature began to cool and the trees to shed their rusty leaves, I’d wander to a neighborhood park and settle my eight-year-old body on the edge of a mossy wooden bridge. In the rain-swollen creek below my dangling feet, a ribbon of salmon would perform a frantic, twisting dance upstream. I’d point and stare at their inflamed bodies, watch them struggle over the jagged gravel bed in search of a safe nesting spot. Unaware of what I watched, I was captivated by the salmon’s movement. I’d imagine they were the same creatures that puttered around our living room fish tank, or were what I tasted when I bit into an oily piece of battered fish. I didn’t know anything about them — I’m not even sure I knew they were salmon — but I loved the colors: bursts of fire red and sunset pink, blurred together in shimmering crystal. It looked as if paint flowed beneath the water; the defining lines of the salmon bodies melted as the fish slipped in and out of shadow, as tiny rapids rolled above their backs. I thought the scene was sweet, exciting; the fish had an audience and they were showing off. But such hues are a prelude to death. Pacific salmon die after spawning, and I was watching the final stage of their lives. I know now, as an adult, that this is a necessary death, not only for the salmon, but also for those of us who celebrate and exploit them. In the Pacific Northwest, we deal in their demise. Our culture — and our land — flourishes on their flesh and blooms from their soft bones. And though salmon sales may fill our coffers and our bellies, it is wild salmon bodies that fertilize our forests. Every year, though, the salmon run thinner. More die in a net or the warming waters of a changing planet instead of a gravel streambed. They die with no eggs to take their place, with no body left to feed the forest. Our hunger for them overwhelms. But our world relies on these fish. Such hunger is dangerous. Salmon are a keystone species in the Pacific Northwest, a species that, despite constituting a relatively small portion of the region’s fauna, is integral to the environment’s stability. In addition to humans, salmon feed birds, bears, and otters.They shoulder the burden of the forest ecosystem. When grizzlies leave half their fish harvest on the forest floor to rot, decaying salmon bodies gift ocean-born nutrients to the earth. Nitrogen and sulfur, carbon and phosphorus. Salmon ensure that the forest is lush and fertile. Spruce tree needles swell with marine nitrogen; the first that line spawning streams burst from the ground as if fertilized with steroids. Salmon fuel the forest. And when the fuel runs out, the forest will stall. If the forest goes, so will the economy. The $38 billion commercial fishing industry will collapse and hundreds of people will be left without jobs. But the real loss of salmon would mean a loss of culture, of identity. When I was a child, I didn’t know what these fish meant to the place I lived, the Pacific Northwest. I didn’t know we hunted those salmon, revered them, and claimed them as our totem. Natives often say that the Pacific Northwest boundaries extend as far as the fish can swim. The image of a leaping fish is emblazoned on the Washington state quarter and the coastal tribes carve the fish’s likeness on intricate totem poles. Inside the belly of a Northwesterner will be chinook and coho, sockeye and chum — our veins are slick with fish oil, our blood full of their fat. Who would we be without salmon? Pacific salmon are so connected to place that we joke their brethren bred elsewhere aren’t even the same fish. Pacific and Atlantic salmon descend from the same prehistoric ancestor, but their paths diverged 5.3 million years ago. Pacific salmon are larger. They can weigh up to 125 pounds while their Atlantic counterparts measure no more than 12 pounds. They are less aggressive, they have more fin rays and more spots. Born in freshwater streams, our salmon splash around in their creek beds for up to three years before they feel the itch, the urge, to see what else exists in the world. This restless feeling drives them toward the ocean. They enter it, tentatively, steeling themselves and preparing their bodies in brackish water, perhaps nervous to cast off home. But once they slip away — body chemistry changed — they are now a saltwater fish, no longer a part of the land but the sea. They revel in the wild, growing fat and long, wise and powerful. Then, something shifts while they’re in the ocean; after just a few years surfing the waves, salmon need to return. It’s different for each salmon. Some might stay six months, some might stay seven years. And for Pacific Salmon, it will be their last trip. 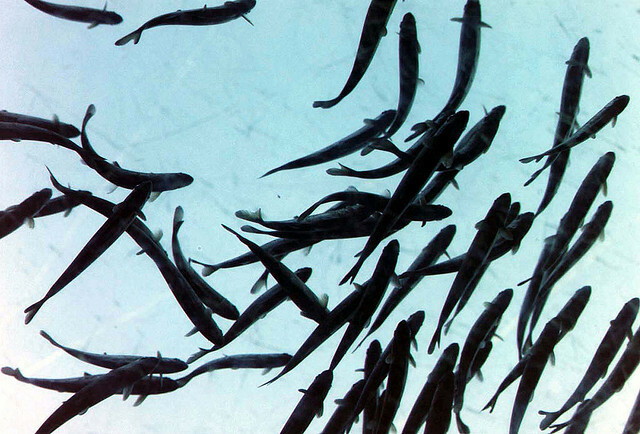 Unlike their Atlantic counterparts, Pacific salmon have no hope of surviving the spawning process. Many won’t even survive the trip home. But they’ve tested their loyalties and know where they lie. It doesn’t matter the cost. Salmon point their noses inland and swim, lured back to the Northwest’s wooded shores by an instinct, by recognition of something within themselves. No one knows why or how, exactly — maybe by scent, maybe by an intimate knowledge of the Earth’s magnetic field — but salmon have to find the exact stream in which they were born. It’s a knowledge I seek for myself. No longer a little girl splashing around in neighborhood streams, I have crossed a continent for a whiff of freedom, a taste of elsewhere. I say that I left home to pursue opportunity — graduate school and a fulfilling career — and it’s true. But what is also true is that I left just to experience elsewhere. Opportunity existed in the place I had always known, but school in my hometown was too familiar; school in the same time zone was too close. I left, I grew, I changed. And now I wait for the next step. The salmon is my totem now. When will I know what it knows? I go to sleep every night in Washington, D.C., 3,000 miles from Seattle, wondering, hoping. Is tomorrow the day I’ll feel the pull? Will I wake up in the morning and finally be done, finally know that it’s time to return? Simply know that it’s time to quit my job, break my lease, sell my possessions and just go home? Perhaps when we claw at cold smoked salmon with our fingers, or gnash pan-seared flakes between our molars, we hope to taste more than the salmon’s flesh. We want a taste of their spirit, of not only the urge that drove them to the sea and of the wildness they found in living there, but also the overwhelming need to come back. We want the unbridled and the passionate. We want to understand our place and purpose. Salmon make their way up a fish ladder to the spawning pools upstream. Photo by Kai Schreiber. CC BY-NC-ND 2.0. And yet, we’re losing salmon in the pursuit. Six different species call the Pacific Northwest home. Six different species of salmon are listed as threatened or endangered under the Federal Endangered Species Act. The Columbia River, the powerhouse of Washington State and a salmon stronghold, hosts a population that’s less than three percent of what it was when Lewis and Clark paddled through its current. We’ve over-fished the waters, destroyed the salmon’s natural habitat, polluted their streams and dammed their rivers. And as the planet warms, our restoration efforts don’t show much promise. We may remove damns and install fish ladders, underwater stairways that allow the salmon to overcome manmade obstacles, but the region’s shrunken glaciers mean less melt water in which the salmon can live. Warmer air leads to warmer water, detrimental because despite their immense strength of will, salmon are delicate. When water conditions vary, they die, and not the beautiful, celebrated deaths essential to the region’s life and health, but pointless, unfulfilled ones. Their colors fade in a streambed, flesh tattered and eyes bulging, suffocated in oxygen-depleted warm water. They die without ever having seen the ocean, without bringing its nutrients to shore. They die without ever having found what they seek in the waves. In the Pacific Northwest, we’re known as the Salmon People, but who will we be when there aren’t any salmon? 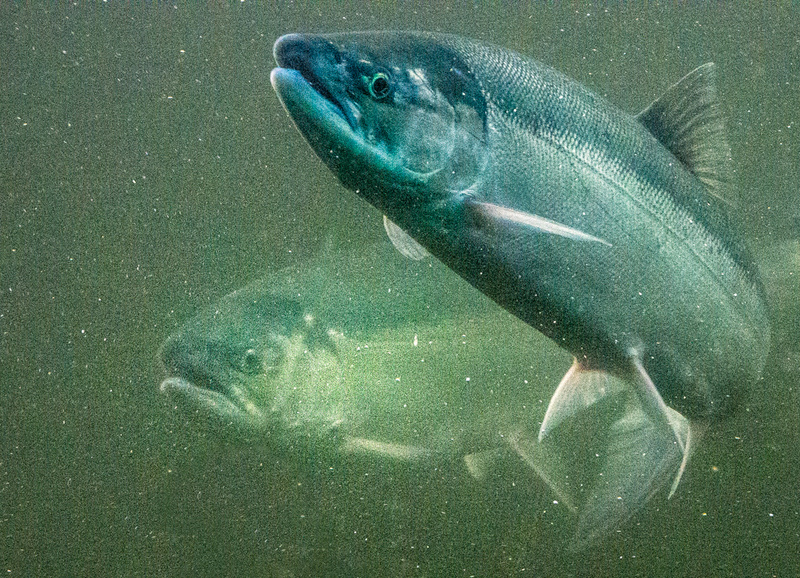 Salmon populations have been shrinking since the first Europeans set foot on North American. An ancient Lummi Nation myth advises that the salmon will return when we learn to care for them properly. When the salmon’s role shifted to include both spiritual life force and economic resource, the Salmon Woman, a spirit who sent her children, these fish, to shore every year as a gift to hungry humans, grew angry.She called her children home and vowed they wouldn’t see northwestern shores until its people began to respect her sacrifice. Yet the salmon population continues to fade. We brought this punishment on ourselves; we eat the fish for their power and spirit, and hope that by eating as many as possible we’ll learn their secrets. We don’t let the salmon bring their knowledge ashore and spill it across the landscape. Instead we rip it from them: handfuls of cold blood and oily entrails, of shattered ribs and barbed backbones. We are harming ourselves. In our need to consume, we will obliterate them. Salmon sacrifice life for life. When salmon leave the ocean it’s not at the same slow, pondering pace they followed during their first journey. They don’t take breaks to acclimatize to the new environments; they don’t spend years in brackish water to prepare their bodies. When salmon are ready to come home, nothing stops them. They head straight for their natal streambeds and don’t stop swimming until they’ve arrived. Their bodies are ripped apart in the process, turned blister-red and spongy. They grow humps on their backs; their jaws curve, and their teeth grow longer and sharper until they look like they belong in a dog’s mouth. The salmon are so beaten and mangled that the journey kills them; once they make it back to their birthplace and spawn, the salmon will only live another few days. But they know where they want to be; they know where they belong. They know a new generation will benefit from their sacrifice. We, too, sacrifice life. But once we have captured, sold, and eaten all the salmon, and have destroyed their homes, there will be nothing left for us — or of us. 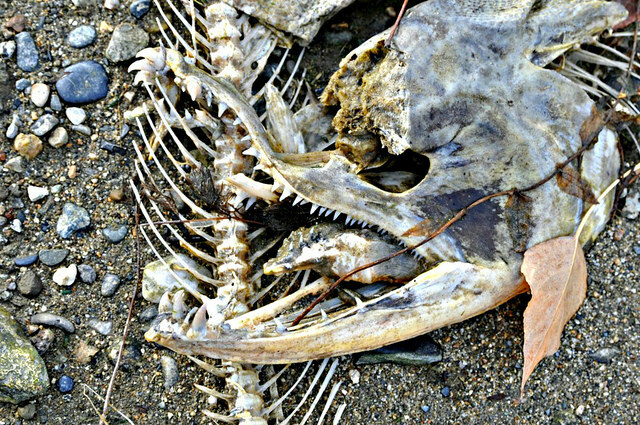 The skeleton of a spawned out salmon rests on the bank of the Columbia River. Photo courtesy of NOAA Fisheries West Coast. CC BY-NC-ND 2.0. Now, in Washington, D.C., I stare into strange, barren streambeds strewn with garbage and think of that moment when I was a little girl, hoping memory can pull those salmon back into existence. I wonder, if I visited the same neighborhood stream now, as an adult, would my mind still wander to dinner, or would it seek something more? Would I look to the fish for guidance instead of sustenance — and would they be willing to share? When we’ve quelled our hunger and controlled our impulses, maybe the Salmon Woman will forgive us. She will send her children back in swarms, and maybe they’ll finally share what they know. Maybe when we let the salmon be, the salt water in which I now tread will begin to sting and to irritate, and I’ll feel the lure of fresh, cold water, of the mountain rivers and endless forests once again. Maybe, I will know the way home. Katie Regan’s work has appeared most recently in Cascadia Chronicle, Pithead Chapel, and The Recorder. She holds an MFA in Creative Writing from Chatham University, where she studied literary journalism and environmental writing. Originally a newspaper reporter from the Seattle area, she now works as an environmental health communications specialist at a Washington, D.C. nonprofit.